You will receive a NO GYM NEEDED, 3 week full body workout program for each challenge. Volume 6,7 and 8 includes HD follow along videos (on BrittneBabe.com only). My 21 Day Challenge is designed to optimize your training for maximum results! Dumbbells ranging from 5-20 lbs are suggested and a mat. Full shopping list and guideline on how to eat and what to eat to lose, maintain or gain healthy weight (vegan and vegetarian options included) PDF downloadable. Ok, so what is the difference between all Volumes? The difference between the challenges are, different workout routines and release dates. Combining all challenges gives you more options with your training and you can begin training with either program. Because the challenge is a guide, it is designed to be used independently at your own pace and risk. Can I join the contest? Current Contest is Volume NINE ONLY! However, you can begin on your own, or with friends or family at any time! Get Healthy, Have fun and Get Fit!!! Check out my AT HOME WORKOUTS on BrittneBabe.com designed to build every curve! 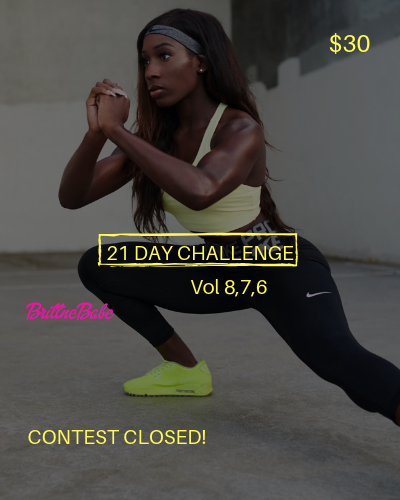 Bundle packages focus on building your Booty, Sculpting Abs, and more! Sign up today! For 24/7 INSTANT ACCESS! Build, sculpt and train your body to be the best you, with my “at home” online programs (HD videos) !